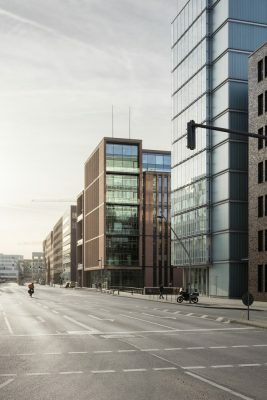 This third building tract is part of an ensemble dating from the 19th, 20th, and 21st centuries, and is a distinctive element of the city – in front of the HafenCity backdrop, on a site area of 1,286 square meters, the extension building adds to the headquarters of Gebr. Heinemann with its two existing buildings between Magdeburger Hafen and Shanghaiallee. 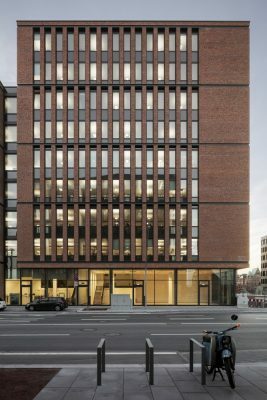 The new building with its first floor and gallery stories, as well as eight further office stories and two underground parking garage levels, has been designed to meet the requirements of the Gold standard of „Sustainable construction in HafenCity“. The building at Koreastrasse 5 is notable for its location at the water’s edge. 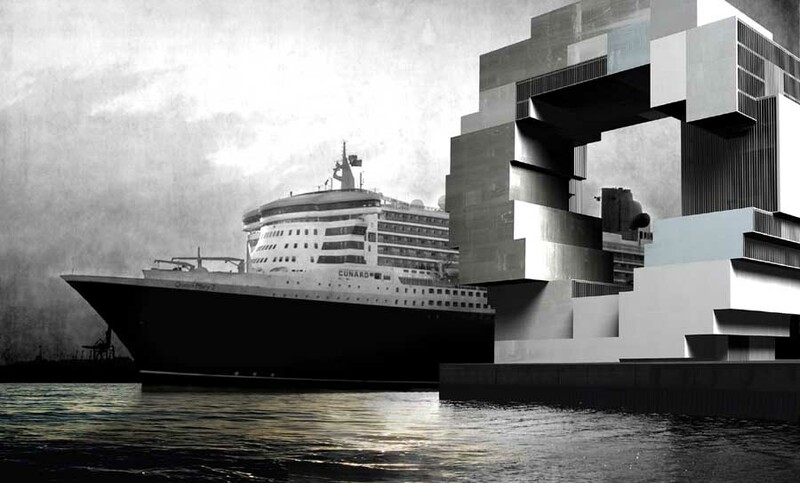 The external wall of the building to the north also forms the wall of the Fleet canal, and towers 42 meters above it. The connection with this maritime part of Hamburg is based on the company’s history; Gebr. Heinemann is a traditional company that was founded at this location as a ship’s chandler in 1879. 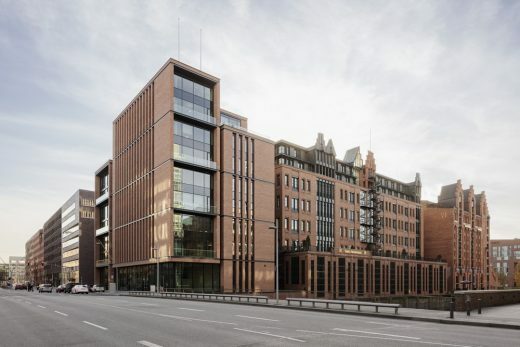 The extension building makes reference to the cosmopolitan attitude of the internationally active Hanseatic trading house; located directly next to the Heinemann-Speicher, the building blends well with its surroundings, given its brick and glass facade that is typical of the location, the vertically structured facade relief, and the vertical fenestration arrangement across stories. The new building also references the Maritime Museum that borders the company site to the west in terms of aesthetics and shape, thus mirroring the traditional stability of the quarter. 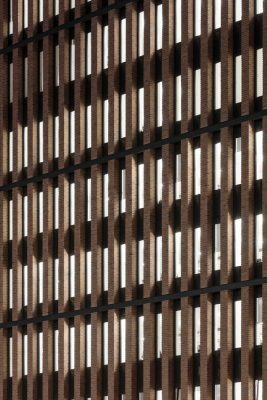 Elements such as the historic loading openings of the storage buildings are reinterpreted with large glazed areas. With its timeless design and its exciting building volume, the structure with its generous terraced flat roofs creates balance between the different eaves levels of the neighboring buildings. 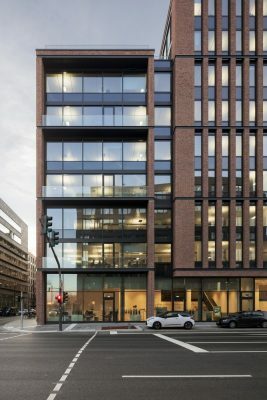 The new and yet independently usable tract is connected with the flanking company headquarters via a glazed connection. Distribution in the building is via a central circulation core. The offices have been arranged around an inner central zone which accommodates shared rooms, such as sanitary facilities. The transparently designed first floor serves as the staff entrance and houses the Gebr. Heinemann Museum, as well as retail premises. In accordance with the client’s wishes, the layout design on the upper floors has been devised to allow maximum flexibility. This makes it possible to divide the space into both open-plan and cellular offices. Gebr. Heinemann is one of the most important players worldwide in the international travel market. In Europe the company is the market leader and, amongst the global players in the industry, is the only family-owned company. In its function as distributor, the company today supplies over 1,000 customers in over 100 countries. In the retail business, Gebr. Heinemann has about 300 Duty Free & Travel Value stores, licensed brand boutiques, and concept stores in a total of 78 airports in 28 countries. Since 2008, the company has been styling its Duty Free & Travel Value stores in accordance with an unusual brand concept. Today, the Heinemann Duty Free brand is represented worldwide at numerous airports, including Sydney. In 2015, Heinemann served over 40 million customers on 115,000 m² of retail floor area. The Gebr. 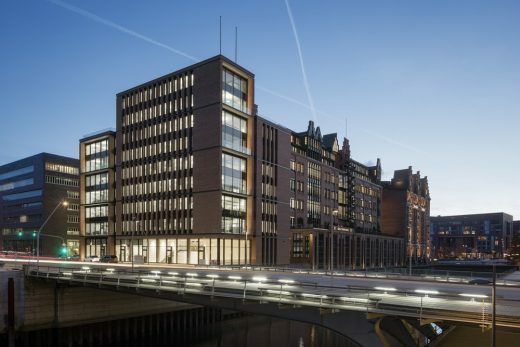 Heinemann head office has been at what is now Hamburg’s HafenCity since 1879. The family-owned company is headed up by fourth-generation family members and cousins, Claus and Gunnar Heinemann. Gebr. Heinemann has a worldwide workforce of 6,000 people. Like the Gebr. 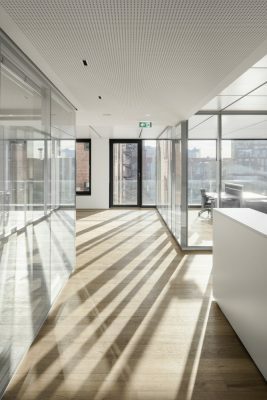 Heinemann company, the design reflects both the traditional solidity of the warehouse district and a flexible adaptation to modern requirements of HafenCity. 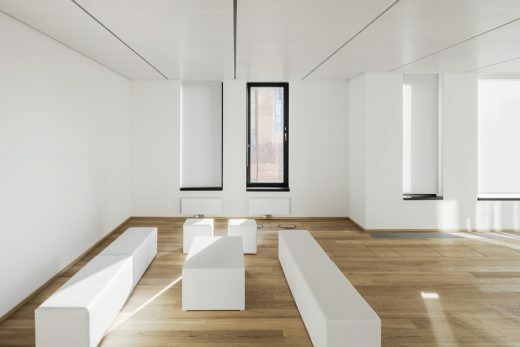 Although a glazed structure connects it to the “Heinemann-Speicher,” the extension is independently useable with an inviting transparent space on the ground floor. Besides serving as an employee entrance, it can accommodate commercial spaces, an arcade, or a café. On the upper floors, users have maximum flexibility in floor plan design. All the requisite functional areas are compactly organized around the central access area and the available floor space can be used for an open-plan office, individual offices, or anything in between. Like the main building and Maritime Museum, the design is characterized by multistory windows, a vertical façade relief, and brickwork typical of the region. The area freed by the two recessed floors forms two spacious roof terraces/roof gardens, mediates between the different eaves heights of neighboring structures, and adds an urban tone through dramatic cubature.